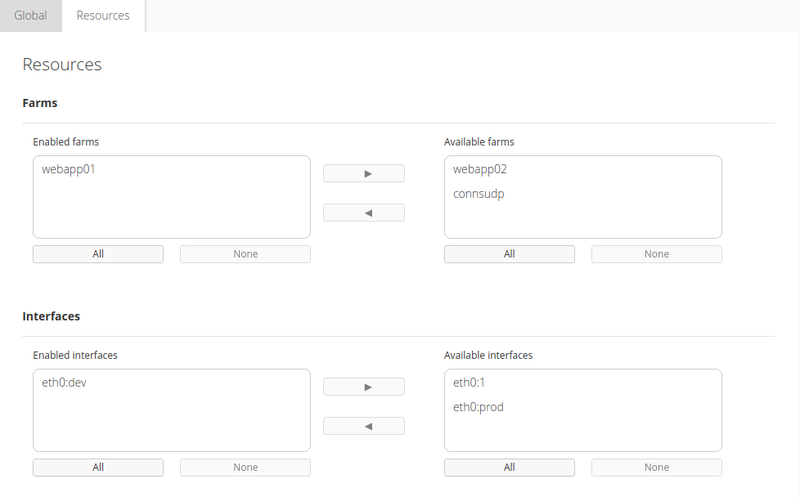 From this section you can configure the group, add or remove resources and users. This is organized in two tabs Global and Resources. Role: This shows a list of the availabe roles, you have to select a role to add to current group. If the group has not role, it is not possible give it permissions over objects actions, the behavior will be the same that when the group has a applied role without none permissions. Enabled Users: It is a list of added users to the group. Available Users: It is a list of all available users to add to the group. The component of Users allows to add and delete users of the group of two ways, you can select the desired users (also below the list you can found the the buttons to select all the list or deselect all the list) and press the button with the arrow that points in direction to the definitive list, or you can drag and drop the desired user on the desired list. Finally, in order to apply these changes, it’s needed to click on the green Apply button and a confirmation message will appear at the left bottom corner of the browser. The component of Farms and Interfaces allow to add and delete farms/interfaces of the group of two ways, you can select the desired resource (also below the list you can found the the buttons to select all the list or deselect all the list) and press the button with the arrow that points in direction to the definitive list, or you can drag and drop the desired resource on the desired list. From this section you can management the farms that the group’s users will have permissions to see. Enabled Farms: It is a list of the member farms of the group. The group’s users will only see these farms when they access to the Load Balancer. Available Farms: It is a list of all available farms to add to the group. From this section you can management the virtual interfaces that the group’s users will have permissions to see. Enabled Interfaces: It is a list of the member virtual interfaces of the group. The group’s users will only see these virtual interfaces when they access to the Load Balancer. Available Interfaces: It is a list of all available virtual interfaces to add to the group.